Block adjustment is the process of computing an adjustment or transformation based on the internal relationship between overlapping images, control points, a camera or sensor model, and a digital elevation model (DEM). After performing a block adjustment, it is necessary to review the results of the adjustment and assess the quality of the control points (ground control points [GCPs], tie points, and check points) used in the adjustment. A summary of the results are displayed in the Adjustment Report window in the Review group on the Ortho Mapping tab. Use the adjustment report to assess the number of control points used in the adjustment, the areas of the image collection where control points and overlap are sufficient or lacking, and the reprojection error in the images. The adjustment report .html file, initial and adjusted GCP positions shapefiles, and tie point matches shapefiles are stored in the Project folder at \ArcGIS\Projects\[project name]\OrthoMapping\[ortho mapping workspace name].eomw\Reports\. When a tie point set is identified in overlapping images, the 3D coordinates of the corresponding point can be calculated in the block adjustment. The 3D point is then reprojected on all the images it intersects, and the distance between the reprojected point and the initial tie point is called the reprojection error. Name of the ortho mapping workspace. Date and time the report was generated. Number of images in the collection used in the ortho mapping workspace. Number of images adjusted in the block adjustment. Number of tie points used to perform the block adjustment. Number of solution points generated in the block adjustment. Average Root Mean Square Error (RMSE) of the reprojection across all adjusted images. The units are pixels. Average ground resolution for all images in the image collection. The units are listed in the field heading. Indicates whether GCPs were used in the adjustment. Minimum number of tie points used in an image adjustment for the image collection. Maximum number of tie points used in an image adjustment for the image collection. Median number of tie points used per image adjustment for the image collection. Average number of tie points used per image adjustment for the image collection. Tie points connecting two or more images are called multirays and are essential for aerial triangulation. This summary table lists the number of multirays detected and used in the adjustment. The number of 2-Rays is the number of 2-point tie point sets, or the number of tie points that connect two overlapping images. The number of 3-Rays is the number of 3-point tie point sets, or the number of tie points that connect three overlapping images, and so on. Adjustment quality is better when there are numerous multirays with many overlapping images. Image identification number. This is the same value as the OBJECTID field in the mosaic dataset footprint table. Name of the image in the collection. This is the same value as the Name field in the mosaic dataset footprint table. Number of tie points used to adjust the image. Average reprojection error across all tie points in the image. The units are pixels. This table lists the camera calibration information for the adjustment. 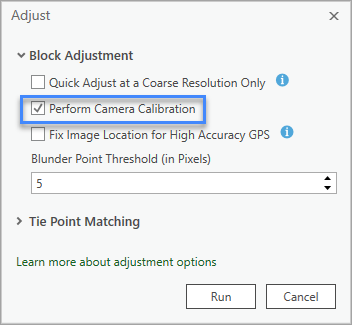 This information is either provided with the cameras tables when configuring the ortho mapping workspace or calculated when you check Perform Camera Calibration on the Adjustment Options dialog box. Principal point is a point on the image plane where a line from perspective center (camera lens), perpendicular to the image plane, intersects the image plane. The X direction is parallel to the direction of image rows. Principal point is a point on the image plane where a line from perspective center (camera lens), perpendicular to the image plane, intersects the image plane. The Y direction is parallel to the direction of image columns. Lens distortion parameters, defined by the Brown-Conrady Model. Image shift in the X direction from the initial position. Image shift in the Y direction from the initial position. Image shift in the Z direction from the initial position. This graphic shows a scalar representation of the GPS deviations for each image. Red points indicate the initial position of the images from the GPS, and gray vectors indicate the magnitude of the positioning deviation as a result of adjustment. The vectors are exaggerated for visualization. When viewing this graphic, you can assess the directional shift of the images in your image collection to evaluate systematic error in the adjustment. The graphic is only listed in the report for aerial and drone imagery. This graphic indicates the level of connection between images. Green points are the image positions after bundle adjustment, and a link between two images means tie point sets were identified between the images. A link with a dark color indicates a larger number of tie point sets and a stronger connectivity between the images. You can identify areas in your image collection where tie points are sufficient or lacking, and use this information to add control points or overlapping images if necessary. The graphic is only listed in the report for aerial and drone imagery. This graphic is a static map of the overlap between images. Higher numbers of overlapping images produce higher accuracy for three-dimensional ortho products. You can use this graphic to identify areas in your image collection that may require additional overlap, or to better understand the accuracy of your adjustment. Total number of Ground Control Points in the GCPs feature class in the ortho mapping workspace. PointID value of the GCPs used to perform the block adjustment. This is the same value as the PointID field in the GCP attribute table. Minimum number of tie points linking overlapping imagery to a GCP. Maximum number of tie points linking overlapping imagery to a GCP. Average number of tie points linking overlapping imagery to a GCP. PointID value of the GCP. This is the same value as the PointID field in the GCP attribute table. Shift in the X direction from the initial position of the GCP. Units are listed in the field heading. Shift in the Y direction from the initial position of the GCP. Units are listed in the field heading. Shift in the Z direction from the initial position of the GCP. Units are listed in the field heading. The minimum, maximum, median, and average directional shift values for each direction are listed at the bottom of the table. The RMSE of the shift across all GCPs is also listed. Residual error in the X direction of the adjusted position of the GCP. The units are pixels. Residual error in the Y direction of the adjusted position of the GCP. The units are pixels. PointID value of the Check Point. This is the same value as the PointID field in the Check Point attribute table. Shift in the X direction from the initial position of the check point. Units are listed in the field heading. Shift in the Y direction from the initial position of the check point. Units are listed in the field heading. Shift in the Z direction from the initial position of the check point. Units are listed in the field heading. The average directional shift for all the checkpoints and the RMSE of the directional shift are listed at the bottom of the table.